Does 70 damage minus 10 damage for each damage counter on Aggron. 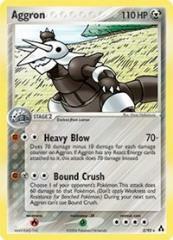 If Aggron has any React Energy cards attached to it, this attack does 70 instead. Choose 1 of your opponent's Pokemon. This attack does 60 damage to that Pokemon. (Don't apply Weakness and Resistance for Benched Pokemon.) During your next turn, Aggron can't use Bound Crush.